Stéphane Rinderknech, CEO of L’Oréal China, spoke to eMarketer about trends in the beauty sector and in retail in China, and about the country’s new beauty consumer. Neil Ackerman, director of global ecommerce at Mondelez International, talks about the food company's ecommerce strategy, which is geared toward reducing friction in all aspects of ecommerce. Consumers are increasingly turning to their mobile devices while they shop, whether to research products or see what other choices are out there. According to February 2016 research, a majority of US female beauty buyers use their device in-store to browse user reviews and look for the best price. Katrina Craigwell, director of global content and programming at digital-industrial company GE, talked about how her team approaches its digital video programming across a variety of platforms and publishers. The vast majority of women in Japan who have a new baby or toddler buy baby items online at least sometimes—but according to 2015 research, they’re also still heavily reliant on offline purchase channels. GrubHub CMO Barbara Martin Coppola spoke with eMarketer about how the brand balances data with agility. 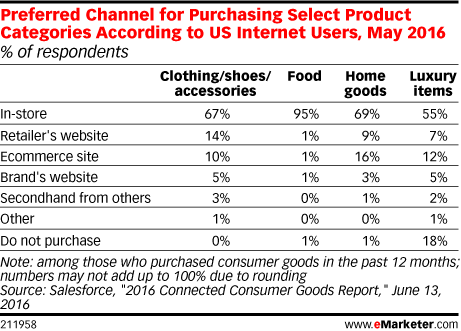 Generally, more US internet users prefer to purchase clothing, food, home goods and luxury items in-store than via other channels, including online, May 2016 research found. US consumer packaged goods (CPG) and consumer products advertisers will spend $5.97 billion on digital advertising in 2016, an 18.2% gain from 2015 that will see this sector account for 8.7% of total US digital ad spending for the year. Prama Bhatt, Ulta Beauty’s vice president of digital and ecommerce, told eMarketer how mobile fits into the omnichannel customer journey. Marketers have been teaming up with influencers for content creation and promotion, and these types of marketing campaigns have generated impressive results. According to December 2015 research, the beauty and fashion industry has also allocated a percentage of their budget to influencer marketing. Millennials are more likely to be heavy cosmetics buyers than their older counterparts, according to November 2015 research. Higher incomes also pointed to heavier cosmetics purchasing.